Less than a month removed from a win in the 2014 World Series of Poker Circuit National Championship, Dominik Nitsche won his third WSOP gold bracelet, taking down Event 21: $1,000 No-Limit Hold’em today. The day began with 16 players and things moved rather quickly with David Lucchesi, Louis Campbell, Mickey Petersen, Dan Alspach, Eric Shanks, and Erwann Pecheux all busting before they moved 10-handed. Lance Harris then bubbled the official final table and Thayer Rasmussen took a hefty lead nine-handed with Nitsche third in chips. Englishman David Burt soon ran his short stack and into Jeff Gross’ aces to say goodbye ninth before Billy Horan took a nasty beat to bust eighth, running pocket aces into Dave D’Alesandro’s own aces and cringing as D’Alesandro four-flushed. D’Alesandro also busted Eric Milas seventh when his tens held against , again making a flush on the river. Bob Bounahra then started to make a move, grabbing the chip lead without showdown. But it was Nitsche who busted Jeff Gross next, sending Gross home sixth when his queens held against big slick. Five-handed play took a good couple of levels and the chips were traded around the table before Rasmussen became Nitsche’s next victim, getting in with against Nitsche’s and failing to improve. Zach Gruneberg also fell to the run-good powers of Nitsche, shoving and grimacing as Nitsche called with and got there yet again. Nitsche would finally lose a hand three-handed, calling with after Bounahra moved in with and D’Alesandro re-shoved with . That hand bounced Bounahra and gave D’Alesandro the heads-up chip lead, but nothing would stop Nitsche tonight. Through a 92-hand heads up battle, no matter how many times D’Alesandro ground away at Nitsche and had him all in for his tournament life, he managed to double up and stay alive. Nitsche got almost even getting it in with against D’Alesandro’s and holding. Then suddenly in the 286th hand, Nitsche took control, getting it all in with against D’Alesandro’s and finding a way to make a heart flush on the river. Crippled, D’Alesandro finally fell when he got it in with queen-high against Nitsche’s king-high and was outdrawn again. With that, Nitsche took home $335,659 and a WSOP gold bracelet, mercifully ending Event #21. 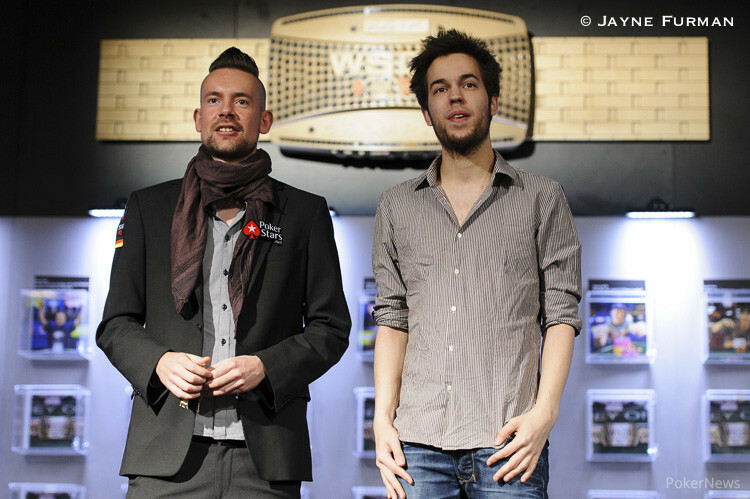 Hand #271: Dominik Nitsche opened to 200,000 and took the pot. Hand #272: Dave D'Alesandro raised to 200,000 and got called. Nitsche bet 250,000 on the river with the board reading , and D'Alesandro called and was shown . Hand #273: Nitsche raised to 200,000 and won. Hand #274: D'Alesandro raised to 200,000 and got called. D'Alesandro eventually won the checked-down pot with king high. Hand #275: Nitsche raised to 200,000 on the button and won. Hand #276: D'Alesandro raised to 200,000 then folded to a three-bet to 500,000. Hand #277: D'Alesandro bet 200,000 on the board, and a hit. D'Alesandro bet 500,000, and Nitsche quickly called. The was a winner for D'Alesandro. Hand #278: Nitsche got a walk. Hand #279: Nitsche raised to 200,000 and won the pot. Hand #280: D'Alesandro raised to 200,000 and won. Hand #281: Nitsche raised to 200,000 and folded to D'Alesandro's shove. Hand #282: D'Alesandro shoved an won. Hand #283: Nitsche limped, an D'Alesandro checked. D'Alesandro check-called 110,000 on the flop, and a led to two checks. A arrived, and D'Alesandro bet 225,000. That was enough to take the pot. Hand #284: D'Alesandro raised to 200,000 and folded to a shove. Hand #285: Nitsche raised to 200,000 and won. Hand #286: The two got it all in preflop. Nitsche made a flush on the board. Hand #287: Nitsche raised on the button and won. Hand #288: Nitsche called a raise and then took down the pot at showdown with top pair. Hand #289: Nitsche raised to 200,000 on the button and took it down. Hand #290: Nitsche got a walk. Hand #291: Nitsche shoved and won the pot. Hand #292: D'Alesandro shoved all in on the button and was called. Nitsche's preflop all in fortune continued as the flop came , leaving him fading just two outs. The turned, and the players got out of their chairs, clearly expecting the tournament to end. It did exactly that on the river. Hand #262: Dave D'Alesandro made it 200,000 and Dominik Nitsche called. The flop came and both players checked. The turn came the , Nitsche bet 250,000 and D’Alesandro let it go. Hand #263: Dominik Nitsche bet 200,000 and Dave D'Alesandro called. The flop was and D'Alesandro check-called a 210,000 bet from Nitsche. The turn was the and after D’Alesandro bet 450,000 Nitsche folded. Hand #264: Dave D'Alesandro bet 200,000 and won the pot. Hand #265: Dominik Nitsche bet 200,000, Dave D’Alesandro moved all in and Nitsche folded. Hand #266: Dave D’Alesandro bet 200,000, Dominik Nitsche called and they saw a flop of . D’Alesandro check-called 150,000, and the turn was the . D’Alesandro check-called 275,000 and the river came the . It checked down, D’Alesandro showed to take down the pot. Hand #267: Dominik Nitsche made it 200,000, Dave D’Alesandro raised to 500,000and Nitsche folded. Hand #268: Nitsche got a walk. Hand #269: Dominik Nitsche made it 200,000 and Dave D’Alesandro called. The flop was and both players checked. The turn was the and both players checked. The river was the . D’Alesandro bet 200,000, Nitsche called and they chopped the pot both showing a queen. Hand #270: Dave D’Alesandro bet 200,000, and Dominik Nitsche made the call. The flop was and after a check from Nitsche, D’Alesandro bet 225,000. Nitsche folded. Hand #252: Dave D'Alesandro raised to 160,000 but folded to a shove from Dominik Nitsche. Hand #253: D'Alesandro shoved from the big blind and took the pot. Hand #254: Nitsche got a walk. Hand #255: D'Alesandro got a walk. Hand #256: D'Alesandro raised to 200,000 and won. Hand #257: D'Alesandro got a walk. Hand #258: D'Alesandro raised to 200,000 and won. Hand #259: Nitsche shoved all in and won. Hand #260: Nitsche got a walk. Hand #261: Nitsche shoved on the button, and D'Alesandro got a count before calling for 1.5 million. The board came , giving Nitsche another double. 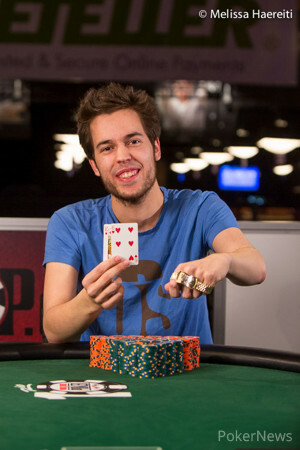 Hand #247: Dominik Nitsche bet 160,000 and won the pot. Hand #248: Dave D'Alesandro made it 160,000 and Dominik Nitsche made thecall. The flop was and both players checked. The turn brought the and they checked again to bring out the river. Nitsche bet 140,000 and D’Alesandro decided to fold. Hand #249: Dominik Nitsche bet 160,000 and Dave D’Alesandro made the call. The flop came and D’Alesandro check-called a 165,000 Nitsche bet. The river was the and after D’Alesandro checked, Nitsche bet 350,000. He called and the river was checked by both. D’Alesandro turned over to take the pot. Hand #250: Dave D'Alesandro bet 160,000 and took it down. Hand #251: Dominik Nitsche bet 160,000 and Dave D’Alesandro made the call. The flop came and both players checked. They also checked the [10c turn, but when the river came down D’Alesandro bet 225,000 and took it down. Hand #237: Dominik Nitsche called the button before folding to Dave D'Alesandro's shove. Hand #238: D'Alesandro raised to 160,000 and took the pot. Hand #239: Nitsche called the button, then bet the flop when D'Alesandro checked to him. D'Alesandro folded. Hand #240: D'Alesandro raised to 160,000 and was called. Nitsche check-called the flop and D'Alesandro bet 250,000 on the turn. The river brought the . Nitsche checked, and D'Alesandro's 400,000 forced a fold. Hand #241: Nitsche limped and D'Alesandro checked. Both checked the board, and Nitsche's won. Hand #242: D'Alesandro raised to 160,000 and took the pot. Hand #243: Nitsche limped, and D'Alesandro checked. D'Alesandro checked the flop, and Nitsche bet 80,000. D'Alesandro raised to 180,000 and Nitsche called. The resulted in a 250,000 bet from D'Alesandro. Nitsche shoved and D'Alesandro called. Nitsche's had been outflopped by , but the turn gave him an unbeatable hand. Hand #244: Nitsche got a walk. Hand #245: Nitsche raised and won. Hand #246: D'Alesandro raised to 160,000 and got called. D'Alesandro won with a bet on the flop. Hands #234: Dave D'Alesandro moved all in from the button to win the pot. 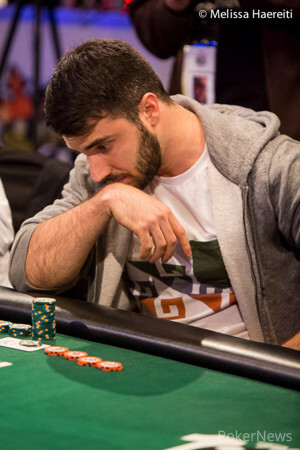 Hand #235: Dominik Nitsche moved all in for 710,000 to win the pot. Hand #236: D'Alesandro moved all in and Nitsche called. This time it was for D'Alesandro versus Nitsche's . Ace-high held on the board to give Nitsche the double. Hand #222: The board was on the river, and Dominik Nitsche bet 200,000 and took the pot after the two players checked it down. Hand #223: Nitsche raised to 160,000 and took the pot. Hand #224: Dave D'Alesandro raised to 200,000 on the button, and Nitsche put in 500,000. D'Alesandro called to see a flop of . Nitsche bet 300,000, and D'Alesandro called. Nitsche checked the turn, and D'Alesandro checked behind. The completed the board, and Nitsche checked once more. D'Alesandro bet 800,000 and was quickly called. He showed for a flopped boat and took the pot. Hand #225: Nitsche shoved from the button and took the pot. Hand #226: Nitsche got a walk. Hand #227: D'Alesandro got a walk. Hand #228: D'Alesandro shoved and won. Hand #229: Nitsche shoved the button and won. Hand #230: Nitsche got a walk. Hand #231: D'Alesandro got a walk. Hand #232: D'Alesandro shoved and won. Hand #233: D'Alesandro got a walk. Hands #220: Dominik Nitsche called a 160,000 open from Dave D'Alesandro and the flop came . Nitsche checked and D'Alesandro made it 100,000. Nitsche called and the turn brought the . Both players checked and the river was revealed. Nitsche checked and a 300,000 bet from D'Alesandro won the pot. Hand #221: D'Alesandro was in the big blind when Nitsche pushed all in. D'Alesandro called and Nitsche was light, holding . D'Alesandro looked poised to win the tournament with . He even held through the flop and turn. But Nitsche paired up on the river to double.